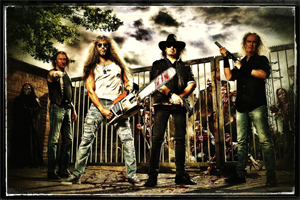 German heavy metal legends GRAVE DIGGER just unveiled the title of their upcoming studio album: It is entitled The Living Dead and will be released on September 14th via Napalm Records. Since their founding back in 1980, GRAVE DIGGER have been leaders in the German heavy metal scene. They created their very own version of Teutonic heavy music - albums like Heavy Metal Breakdown, Witch Hunter or Tunes Of War became classics in the scene. Now the band will return with another face smashing album followed by a big run of shows throughout Europe! GRAVE DIGGER will hit the road again in 2019 with a series of headliner appearances on their "Tour Of The Living Dead", opening in Hannover, Germany on January 11th and finishing in Tel Aviv, Israel on February 9th. See the full list of dates below.